For first, Generation Ahri or SNSD Ahri was only an idea after a fanart and the rumors that it is a unique skin for South-Korean League of Legends players. 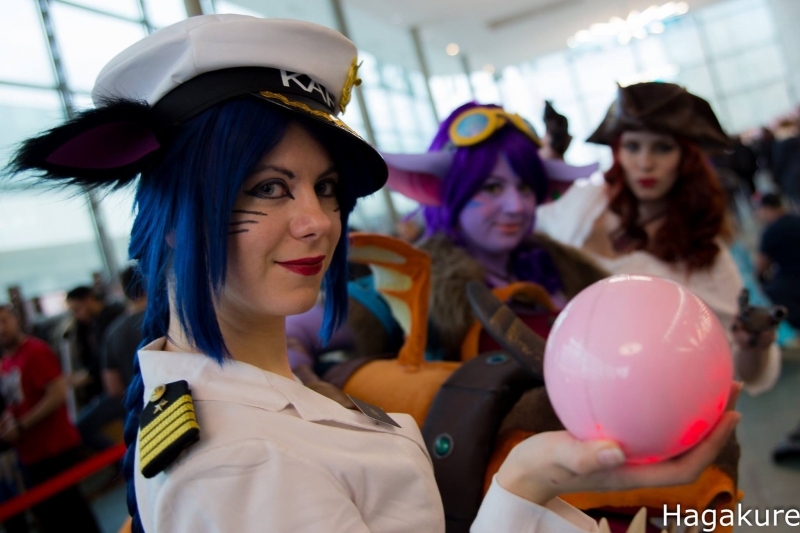 Lot of cosplayers made that skin, and I found Girls’ Generation (SNSD)’s songs, and fell in love with it and that Popstar Ahri dances Genie. I had an idea to form a group of the full girl band with League of Legends characters in the white navy uniform, and I asked some friends to join and learn the dances. 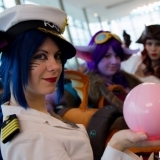 I wanted someone else to be Ahri, someone who already has the cosplay, and she agreed to have the role for first. But later she said that she is afraid she can’t dance with the tails, so somehow I got the role of Ahri. It turned out that I really like to be her, so I want to do more Ahri skins too later! Is it hard to wear it? – Just a little bit. My back can hurt now after a day, but it is maybe because the corset was too big for me. It was okay to wear normally, but it has a very bad hold with the tails. The tails are still heavy together even if it is the lightest version possible, without wires! And yes, I have heels for this costume too, at least they are not too uncomfortable so I can dance in it. Is it available now for a convention? – Of course! After I finished all the upgrades on her (making the tails easily detachable), she will be ready for events and conventions again, even with the other girls! When we are all together, we are amazing! Will you upgrade this cosplay? – Yup, I am still doing it as I write this. I want to make the start of the tails a little bit thinner, make them easily detachable, I have a new corset already (with zipper in the front), and I want to make new, more beautiful and fluffy ears too! I want to make them blue like my hair, with foxy black edge.